What is it? Hibernation is a complicated and often perilous energy conservation strategy. It is not just ‘going to sleep.’ In sleep all bodily functions remain nearly normal but in hibernation the metabolism is almost at a standstill. Like all other animals, hedgehogs need energy in order to maintain normal body activities, to grow and to move about. This energy comes from their food ( slugs, beetles, caterpillars, snails etc ). As the weather get-, colder such food becomes more difficult to find and so they decide to slow down their use of energy. They become immobile, their bodies cool and their normal physiological activities are slowed down e.g. their heart rate decreases considerably from approximately 190 per minute to a faint 20 per minute, the body temperature, which is normally 35°C drops to 10°C or less and respiration almost stops ( they will breath about once every few minutes). This is very dependent on the prevailing weather conditions and starts when the temperature in the immediate surroundings becomes and remains relatively low, which in Britain is usually November, December or even January. There also appears to be an internal readiness that brings about certain physiological changes. Towards the end of autumn, hedgehogs consider the best places to build nests ( called hibernacula ). Favourite sites are under hedges and roots of trees, in piles of brushwood, inside compost heaps or in old rabbit burrows and underneath timber buildings and sheds. The nest itself is ramshackle in appearance but well constructed from old dry leaves,grass and otl1er vegetation and can be up to 50 ems (20 ins) thick. Most hedgehogs seem to wake up fairly frequently during their hibernation but rarely leave their nests. These arousals last a day or two and, although generally unprompted, they may be caused by a disturbance or unexpectedly hot weather. (Should the weather become too cold hedgehogs will not bother to add extra insulation to their original nest but will go and build another one). Hedgehogs in warmer climatic zones appear to be able to manage quite well without hibernating. The descendants of European hedgehogs acclimatised in New Zealand only seem to hibernate for short periods in July and August. Even in Britain, if there is enough food and the air temperature is not too low, hedgehogs need not hibernate. This applies especially to those that may be kept indoors through winter – e.g. youngsters found in autumn, weighing less than 450gms (1lb) and thus being vulnerable to problems during and just after hibernation. Because hedgehogs are immobile during hibernation they are very vulnerable to climate and disturbance. Hence, the need for protective hibernacula. They are also at particular risk if the air temperature falls too low (e.g. below freezing point ice crystals may form in their blood). If the environment cools below this temperature, their body functions have to “switch on” again and this may rouse the animal to activity. Usually, hibernation ends about mid-March to early-April but this may vary in years with exceptional weather conditions and from one to another. If the mechanisms of hibernation could be applied to humans, perhaps astronauts and other explorers could make long duration expeditions without having to carry large quantities of food. 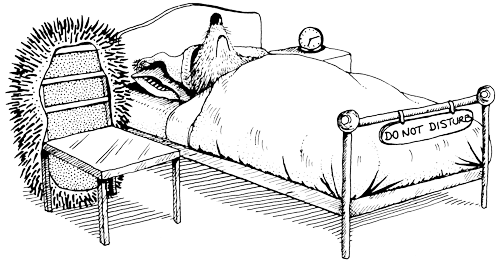 Since, during hiberna-tion, physical damage is less traumatic to an animal’s body, there is also medical interest in hibernation as a way of improving the toler-ance of human bodies to major surgical operations. For further reading on hedgehogs we highly recommend these excellent books: ‘Hedgehogs’ by Dr Pat Morris*, ‘Hedgehog Rehabilitation’ by Kay Bullen* and ‘A Prickly Affair’ by Hugh Warwick*.